Turning around low-performing schools is incredibly difficult work. School and district leadership must simultaneously implement multiple new initiatives toward better results AND change the school’s culture. There is often the expectation that Turnaround leaders can develop and fine tune all of these skills without professional development and practice, which is unfair to them and to their students. 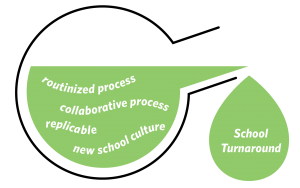 Working with school districts and turnaround leaders across the country, UPD has developed a proven data-driven performance management process called SchoolStat for Turnaround. The process builds the capacity of building-level leaders, instructional coaches, and teachers to use data and conduct inquiry-based, collaborative problem-solving discussions to quickly improve student outcomes. SchoolStat for Turnaround provides focus by helping educators develop the skills they need to turn data into actionable information which they can use to identify — and replicate — strategies and tactics that work. In a SchoolStat for Turnaround engagement, UPD works with the District and school leadership to identify the right metrics and to ensure reliable and accurate data can be routinely collected and tracked. Prior to each session, we prepare the data in easy-to-get visualizations so that educators don’t have to spend valuable time sifting through data and interpreting results. And we prep with the leadership to anticipate and work through difficulties we anticipate. We facilitate the SchoolStat sessions to keep the discussion focused on tactics and results. And we debrief with the leadership to understand what worked and where leadership needs to improve.